My master plan is to shovel as little manure as possible. For any stock that I keep. 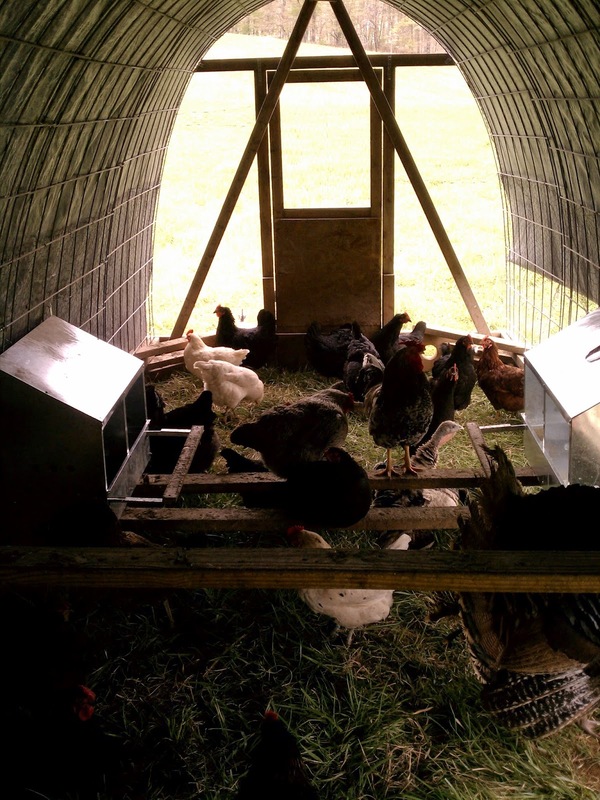 Pastured poultry is not so simple as one would think. We tried many iterations to get to this design (over 3 years), and even in the future it may be modified, most likely to become lighter weight, although blow over would be a risk in storms. I would also like to start saving the water that collects from the tarps, but haven't decided on a good serviceable system yet. The idea is to have fresh grass forage for the egg hens daily. They really can pick an area down in a short amount of time, so we move the hoopies daily. The hens get very excited as the hoopie moves over the new grass. This makes the move easier, as they are always eager to get onto the new hay and have no trouble staying out of the runners and out of danger as the cage is moving. Each cage is 8x16 and the tarps roll up to allow as much or as little sun and air into the structure as is needed for keeping things cool or warm. 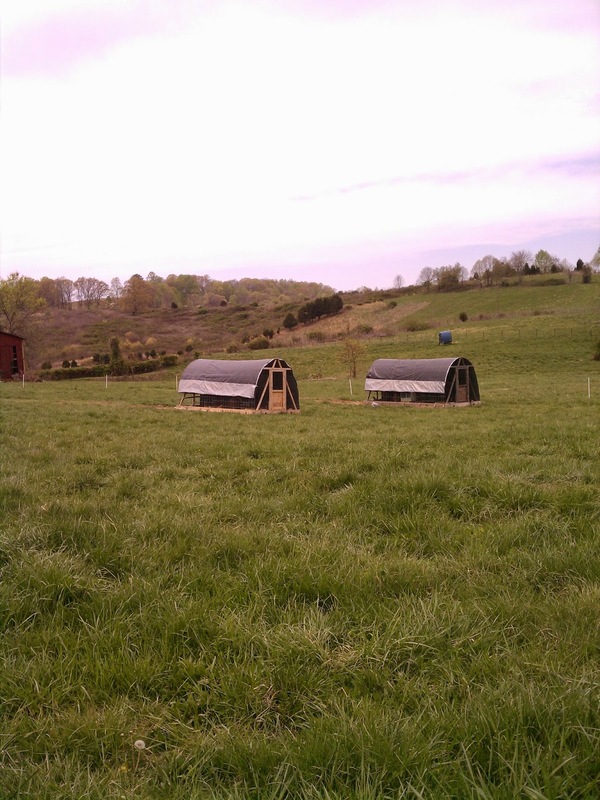 There is no bottom on these houses, so all manure falls directly on the hay field and fertilizes the grass. So far we have seen 70 MPH straight line winds, and the hoopies have not tipped or collapsed. They are quite heavy as the bases are made of 2x10 lumber. The ends are built from 2x4 lumber with braces and a door all screened in with chicken wire, while 4 pieces of 20 ft cattle panel make up the hoop structure. Chicken wire covers the cattle panel to prevent escapes. We have also found that investing in AG grade tarps with a 4 year life time seems to work the best. They are UV stable. Hardware store tarps are a waste of money and only last about 6 months in the element. Roosts are high in the rear of the structure to keep the chickens from roosting in and soiling the nest boxes. I prefer to have the cleanest eggs possible. The nest boxes are approximately knee high inside, and there are 4 boxes for 16 hens. We use a log chain and the truck or tractor to drag the units around the farm one length at a time. One time per day preferably. I can envision the possibility of someone wanting to use draft animals to move them. The hoop house helps lower feed bills, and the chickens have great access to bugs and worms and plant material. The egg yolks are a deep orange. I have to say that the grass in wake of the hoopies is absolutely the most astonishing deep green. Great fertilizer for the hay field. Why pen the chickens up? Several reasons. The electro-net we tried (and invested in heavily) didn't really work. The chickens' feathers insulated them from shock. Also, since I have lighter breeds they are excellent fliers. Not conducive to electro-net success when the birds just sail right over. So the chickens were on the picnic table, in the garden, wandering across the road and laying eggs all over the farm in mysterious places. Sorry to confine you girls, but it is for your own good. Since building these, the losses of stock have been minimal, they have adequate shade in the summer and nice warm protection in the winter. So far has been an excellent system for us. We are zone 7 so heavy snow is not an issue, nor is prolonged deep freeze.